Lawrenceville and Princeton experienced minimal snowfall on Jan. 18, but the Rider Facilities crew was still breathlessly shoveling snow off the sidewalks mid-afternoon. When the commonly used roads are not fully cleared yet, it is the commitment of the staff that gets the job done quickly, according to groundskeeper Jay Kubitsky. Ray Martin, a meteorologist from Nevada who keeps a close eye on his hometown of Ewing, reported 52.7 inches of snowfall this winter as of Feb. 18. Additionally, the National Weather Service has reported that January and February have been roughly 5 degrees lower than normal. Parking lots, roadways and sidewalks need to be clear and safe before campus opens. If slippery conditions or even as much as one inch of snow are in the forecast, Facilities is on site before, during and after the storm. “Right before snow starts to seriously accumulate, [the administration] calls us in,” Kubitsky said. Plowing, salting and shoveling help make the campus “as safe as possible,” said Dean of Students Anthony Campbell. 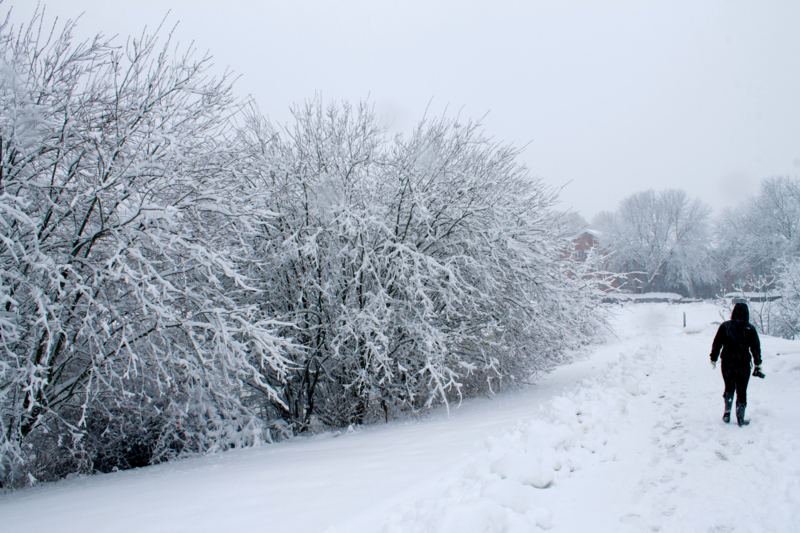 During a snowstorm, most employees in Facilities Management are used for snow removal, including mechanics, carpenters, a locksmith, repairers, management and student workers, said Mike Maconi, director of Facilities. The clean-up process does not stop there. Ten to 15 workers are given shovels. Once the main paths of travel are deemed safe, the crew must then clear snow from drains to avoid flooding, clear parking spaces and move piles of snow when necessary. Facilities uses trucks with plows to clear roads and parking lots as well as five smaller pieces of equipment with plows for sidewalks. Although it is hard labor, Reca said that the crew is up for the challenge. The work begins long before snow hits the ground. Starting in October, the Facilities staff begins to prep for winter by replenishing supplies such as rock salt, sand and shovels. This winter, 150 tons of salt and sand have been used on Rider’s campuses. Still, students have had mixed reactions to how snow removal is being handled this winter. But Gabby Sully, freshman arts administration major, found it easy to maneuver on campus after storms have hit. “I haven’t had a problem driving on campus,” she said. If it is a question of whether or not conditions are too dangerous to hold classes, a committee is first consulted, Campbell said. The deans of all colleges, provost, director of Human Resources, associate vice president for Institutional Planning, Facilities Management, the Lawrence, Princeton and Ewing Police Departments, Accuweather, the Weather Channel, the National Weather Service as well as how neighboring universities are preparing have a voice in deciding to close or delay the opening of campus. Another group on campus that is hard at work throughout the winter is the Aramark staff. Even if classes and offices are closed, students still have to eat, so the Daly’s staff works tirelessly through all conditions to keep the campus fed. Employees are still expected to be there at their regularly scheduled shift when it snows. Most Daly’s employees “press themselves to get to work,” Raul Cortes Jr, an eight-year Daly’s employee said. Employees make their best attempt to come to work rain or shine. Although one might think that students would stay in their rooms and heat up food, about the same amount of people walk through the doors of Daly’s on a storm day as a normal day, according to Cortes. The only difference is that there really is not the dreaded “Daly’s rush,” which tends to peak around 12:30 p.m. and 6 p.m. each day. Even though this winter seems particularly cold, according to Dr. David A. Robinson, New Jersey State Climatologist, it is not. It is the 25th coldest January since the early 1900s. According to Robinson, Mercer County has seen the worst of the winter — compared to north and south Jersey. The county has gotten a little more snow, and temperatures have averaged a little colder. Robinson is interested in the rapid fluctuations in temperature. Although warm weather seems ages away, the region has had several days north of 50 degrees in January, which quickly turned back to freezing cold, seemingly in the blink of an eye.